In soccer, some ties are wins and some ties are losses. 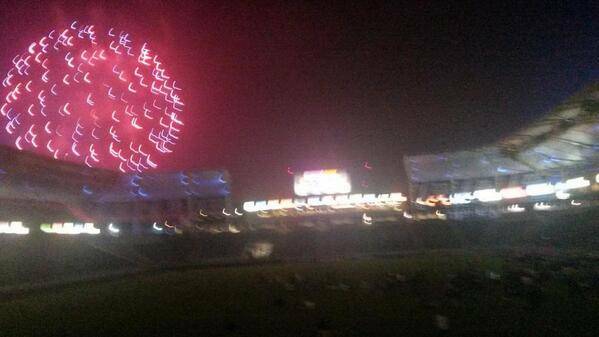 After Friday’s game against the Portland Timbers, as I sat there gut wrenched watching a firework display juxtaposed against the score board still lit up 2-2, it was pretty clear which kind this was. It isn’t often in sports you get to witness a come-from-behind loss, but this is essentially what we saw on Friday. A Galaxy team, just good enough and lucky enough to save itself from total collapse. So how did Portland manage to pull it off? For one, they played one of the best games of their season. But from a tactical stand-point their advantage was simple: their full backs tore us apart. 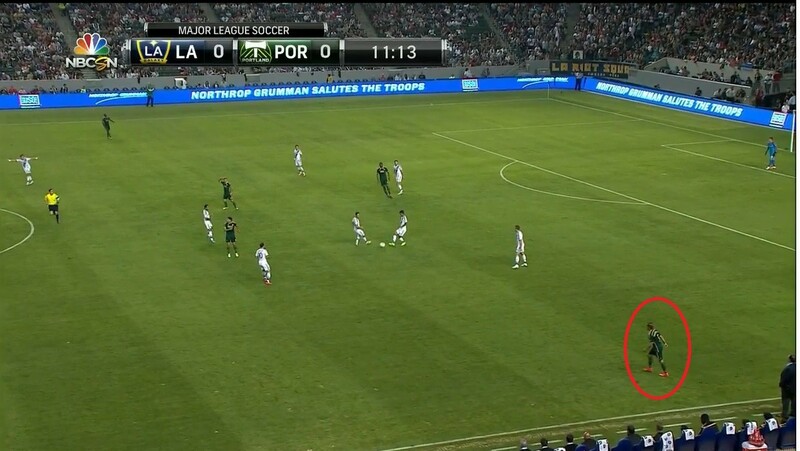 But in the LA Galaxy’s inability to cope with the threat we saw a much deeper problem. A problem of unfamiliarity; a problem of team cohesiveness — or lack thereof. It’s a problem that seperates this Galaxy team from the truly great Galaxy team’s of years past. But first let’s start with the tactics. This greatly bolstered Portland’s attack in many ways. It essentially created a middle four of Johnson and Chara, flanked on either side by the full backs, Harrington and Villafaña. The following is a combined passing chart of Harrington and Villafaña, followed by a combined passing chart of Johnson and Chara. As you can see, combination between the two was quite prominent. 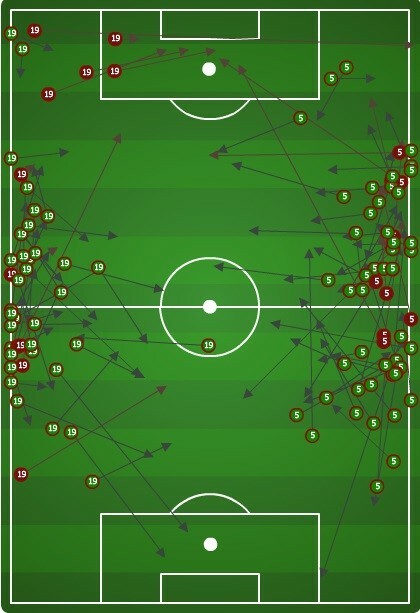 Basically, Portland utilized combination play down the flanks to work around Juninho and Sarvas. Portland kept it up all night, and in the 66th minute it was Villafaña who whipped a ball into Adi and initiated Portland’s first goal. Johnson proceeds to release Villafaña down the left hand side. Villafaña puts a good ball in and after a bit of caroming in the box runs in and scores the goal himself. 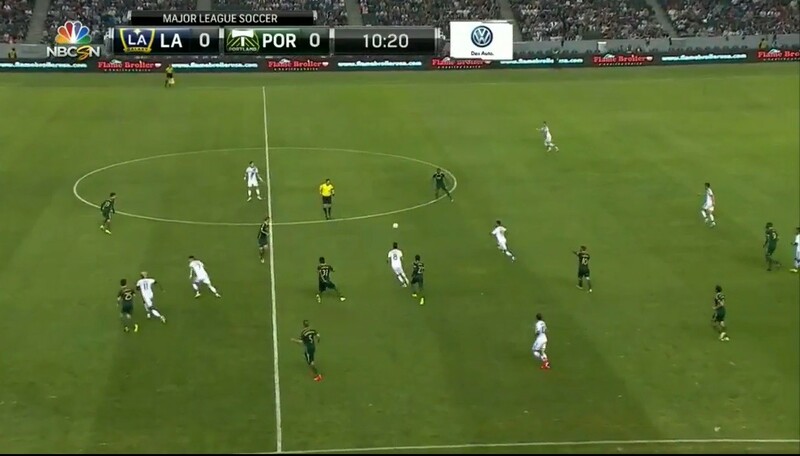 From a tactical perspective, the underlying weakness of Portland’s approach is that players can easily be caught out of position during turnovers. 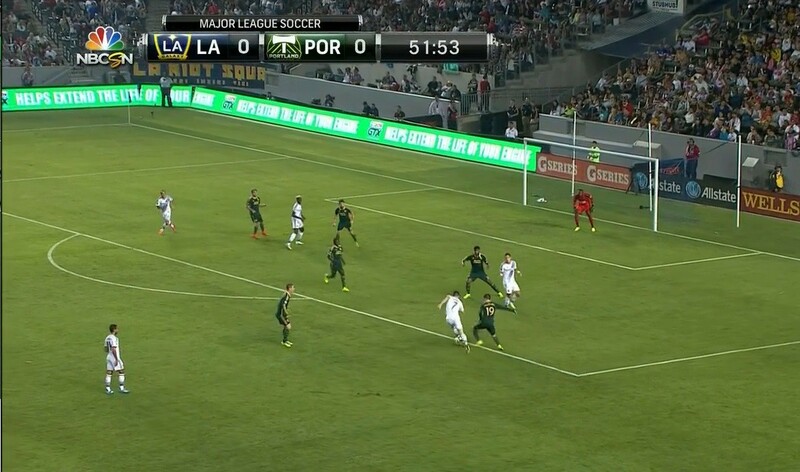 LA had plenty of chances in the first half to make Portland respect this counter threat, but failed to capitalize. The result was that Villafaña continued to streak down the left hand side all game — and in the second half, he was a part of both goals. Here is where it’s so important to field a forward pairing with a good understanding of one another’s tendencies. 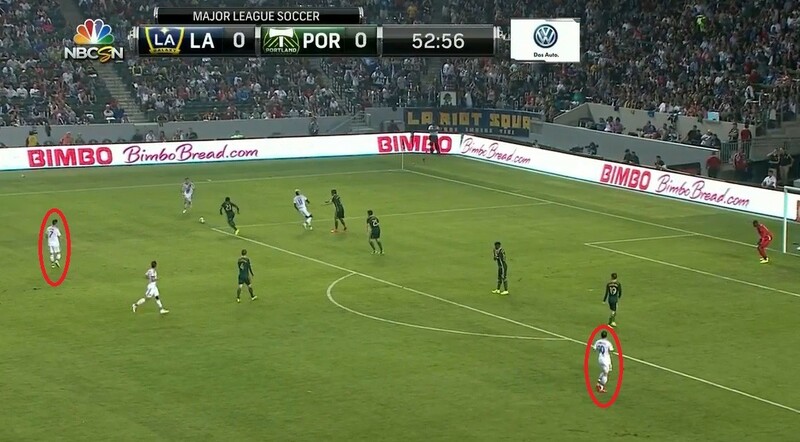 In the picture below, either Robbie Keane or Gyasi Zardes needs to immediately run left into the vacated space. Here I believe that Gyasi expects Robbie to make the run, and as a result, by the time he realizes what Robbie is doing and makes the run himself, it’s a second too late. It’s also worth noting that this is a horrible no advantage call by Marrufo, who had a less than stellar night overall. 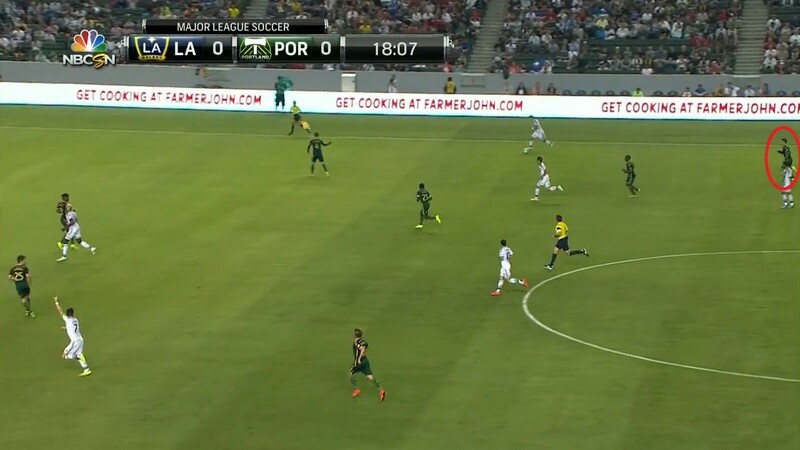 As you can see, the ball is being played to Juninho and Zardes is making a run into open space. At the same time, look what Juninho does when he receives the ball. 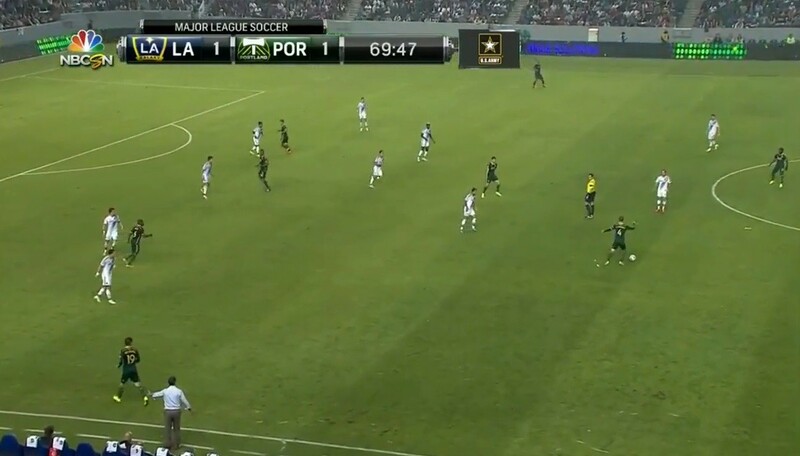 Even if advantage had been played, Juninho receives the ball and turns in the opposite direction of the clear opportunity from Robbie and Gyasi. For me, this is indicative of a team that lacks that innate sense for each others movements, which only time and regularity can bring — and a regular system is not something we have seen from the Galaxy this year. And when I say with him, I do mean with him. He essentially makes the same run as Keane, once again showing his greenness. The other major problem here is that Ishizaki makes the choice to check to the ball instead of accelerating into the space on the right hand side. Ishizaki doesn’t start to make the run until the ball is actually played, at which point there is little hope of him being quick enough to get down the field and serve as a back post option on the counter. With two runners on top of each other and two outside midfielders who are unable to catch up, the end result is just poor positioning all around. One has to wonder: if it were Gyasi at left mid and Donovan at forward, could Gyasi accelerate through the left hand channel, and Donovan make a run more in sync with Keane? 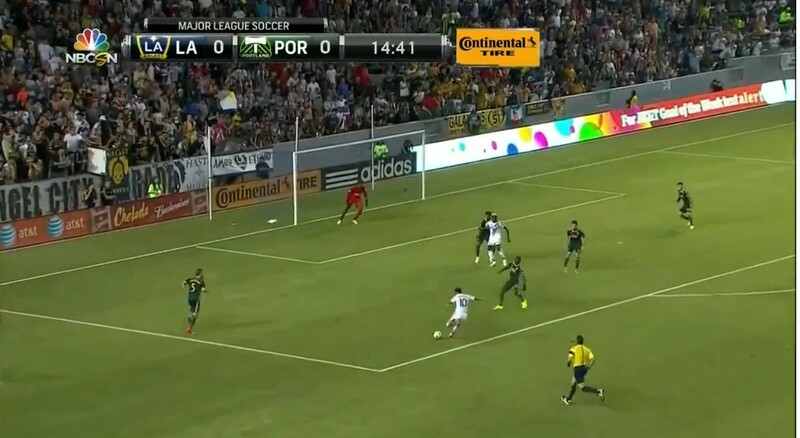 Now, if I’m Gyasi Zardes, as soon as I see the ball being cut back to Donovan I’d alter my near post run in order to keep that channel as large as possible. But Gyasi continues his run and cuts down Donovan’s angle by dragging a defender along with him. 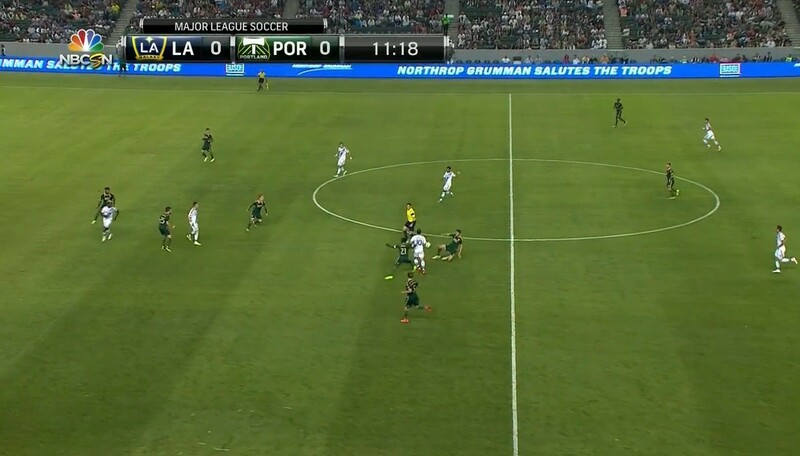 However, this does open a very small window for Keane, who is sitting just out of frame on top of the box. Donovan recognizes it and cuts the ball to him. Unfortunately the pass does not have enough pace on it — by the time Keane receives the ball, the window has closed. This through ball, while ambitious and showing great vision, ultimately was to a player doubly marked. Now it is no secret that I am a huge fan of the Donovan and Keane forward pairing, and I made this very clear in my article last week. In the second half Bruce made me a happy camper by swapping Gyasi to left mid and Donovan to striker. Suddenly the LA Galaxy attack looked much more dangerous. Not only did Zardes’ speed and overlapping runs add dynamism to the midfield, but Landon was able to have more of an impact on the game. 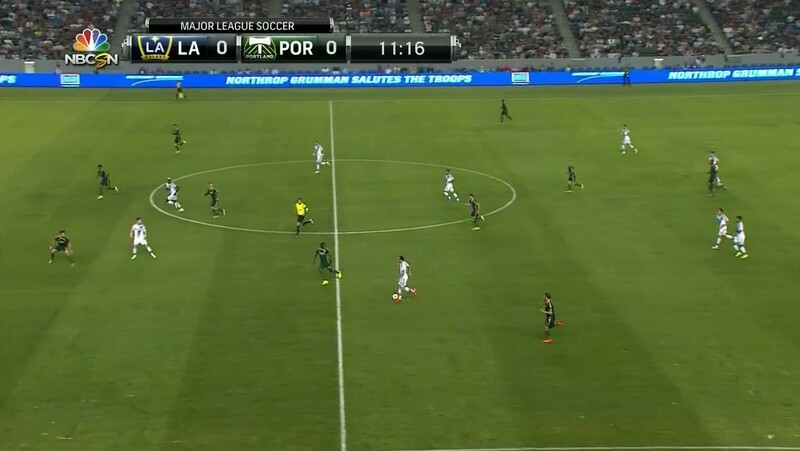 Had we started the game like this it is entirely possible that Portland’s outside backs would be more cautious going forward and wary of a Galaxy counterattack. 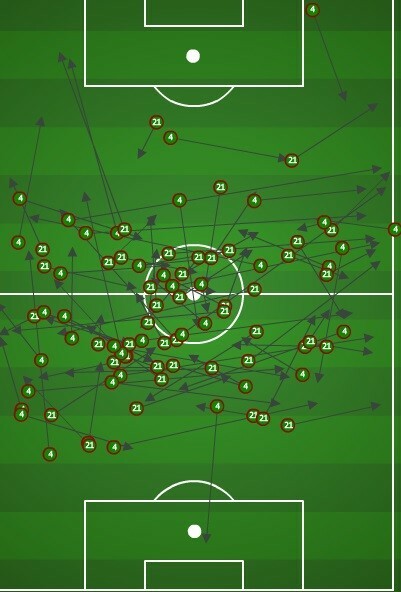 One of the big reasons why the Galaxy’s attack was so much more successful in the second half was that they started to move together as a team — and their player rotation and interchange started to wreak havoc on the defense. 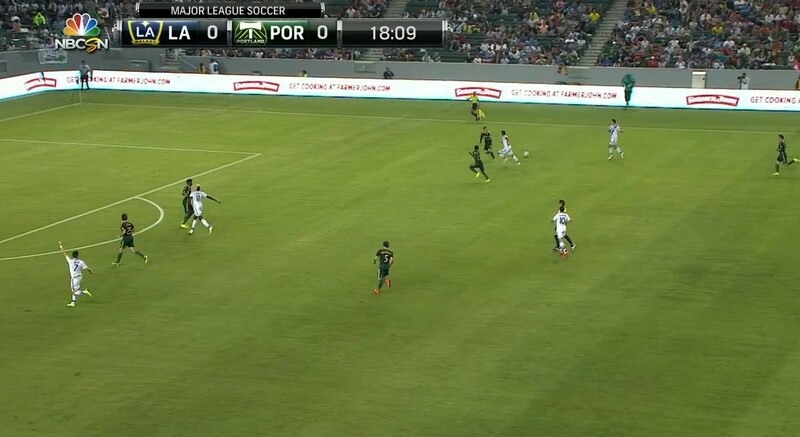 Here we see Donovan out wide to the left, and Gyasi posting up as a forward. But mere moments later the ball gets checked back to Juninho and they pivot the other way, with Keane at right mid. As the play develops further, Ishizaki makes a run into the box and Landon checks back, while Keane begins to take players on at the top of the box. All of this off-the-ball player movement is incredibly important because it just might open up a shot for Keane. It didn’t this time, but the movement was good regardless. As a whole, I would say that Landon’s play as forward in the second half – especially in the last twenty minutes – was stellar. By now it should be pretty clear what Donovan’s best position is on this team. 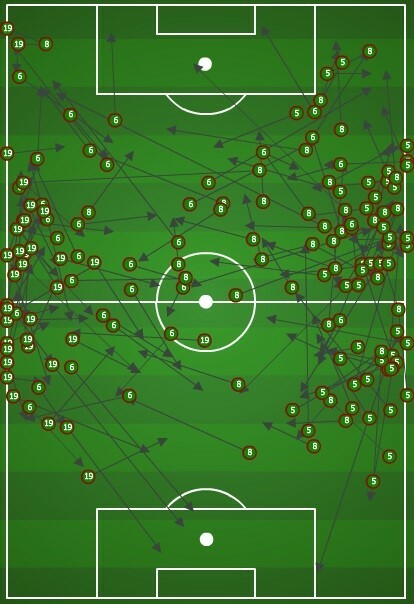 The Donovan – Keane tandem may not be perfect, but if you supplement it with Gyasi’s ability to shift in and be an aerial threat, it’s clearly the best option for the Galaxy attack going forward. I often refer to the Donovan – Keane pairing as a pseudo false nine, and here is a perfect example of why. Gyasi has just advanced the ball down the left hand side and has laid it off to Rogers. Note where Keane and Donovan are. Maddening to Rogers, who is looking for a simple cross? Perhaps. Maddening to a back line who are constantly having to pass off marking assignments with all this movement? You betcha! 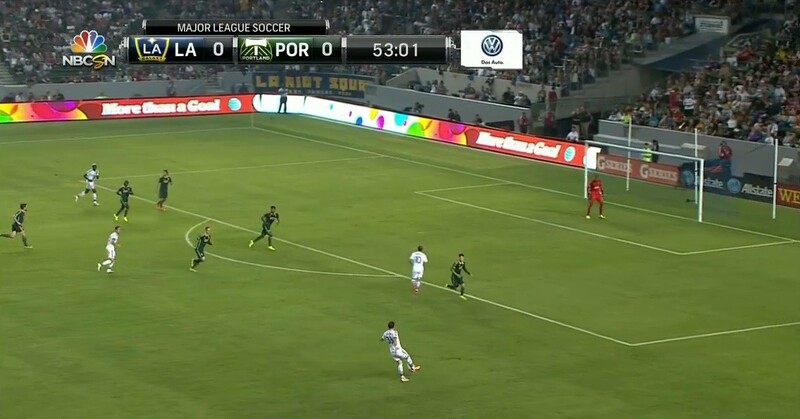 If this was timed a little better, or Gargan one-times it, Donovan is in unmarked. Even mistimed this sequence results in Landon laying the ball off to Keane, who has ghosted to the top of the box and takes a dangerous shot. When the Galaxy finally scored it came from another nice bit of player movement. 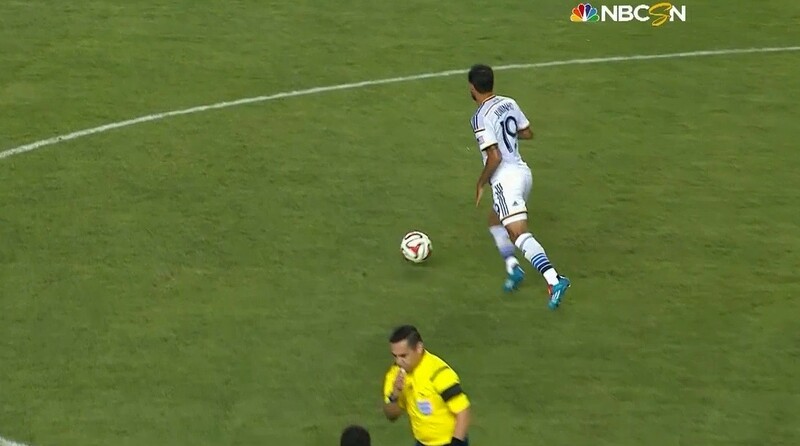 Ishizaki receives the ball on the right, dribbles inside bringing defenders with him, and releases Juninho into space. Juninho’s cross wasn’t perfect, but it fell to the feet of Sarvas and Gyasi moved just enough to open a shooting window for him. It would be unfair, however, to blame the goal entirely on Gyasi. For one, as soon as Valeri gets by Juninho he needs to be yelling at Gyasi to let him know. Furthermore, AJ doesn’t see the back post run which may have caused Gyasi to pursue further. Was this due to AJ and Meyer being a relatively new pairing? Possibly. The question certainly can be raised – but most importantly, this play is a breakdown in communication. Someone needs to tell AJ about the man behind him; someone needs to tell Gyasi about the man behind him. It’s as simple as that. No individual blame. The team needs to move better together. And that’s the sense I get from the entire game. All credit to Portland, who probably played one of the best games of their season (especially Villafaña) — but after rewatching this game, I can’t help but feel that Bruce has done just a little too much tinkering this year. Some of it was necessary, but some of it has been purely his choice. By failing to settle on a formation and set of personnel, the Galaxy haven’t had a chance to gel as a team. 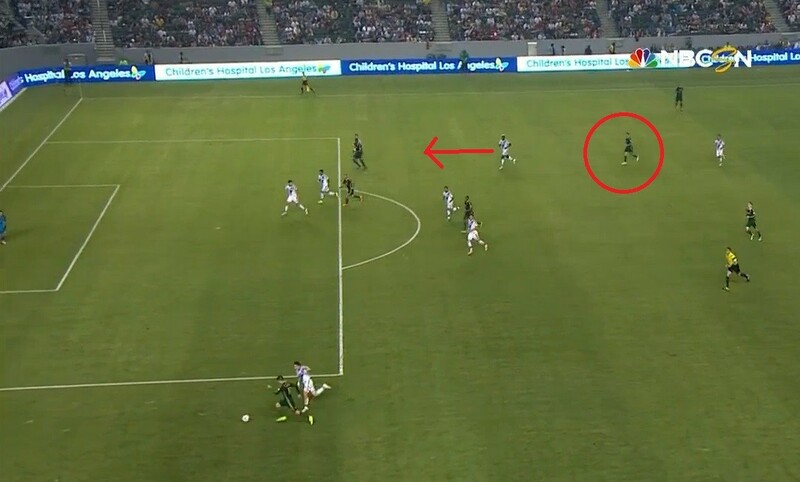 And putting aside the 1v1 magic of Robbie Keane, moving as a team is how this team operates.